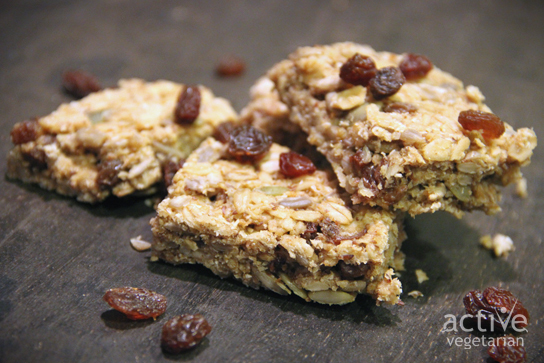 I wanted to make a tasty and healthy snack to share with my yoga friends this week so I started a kitchen experiment and since my class is on Sunday morning I decided to make a granola bar. 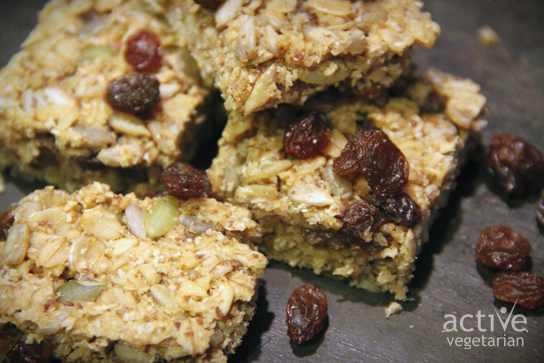 These tasty bars were filled with oats, healthy seeds and raisins. They were very simple to make and smelled delicious while baking. I love that these bars have very little sugar in them yet they till stay together without making a giant mess! Mix oats, pumpkin seeds, sunflower seeds and raisins in a large bowl. Whisk together nut butter, sugar, milk and sea salt. Pour into oat mixture, and mix well, till everything is sticky and combined. If it’s too dry, add a bit more milk. Press mixture into a shallow baking dish that you’ve greased with a bit of coconut oil. Allow to cool then cut into bar shapes. They will last two weeks in the fridge. Don’t forget to join our community for more healthy recipes . If you tried this easy recipe– tell us how you liked it in the comments below! Looks a great recipe. What is natural butter? Cow’s milk butter?